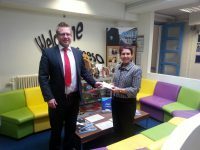 New Directions Education are proud to be working in partnership with St Julians School, Newport. New Directions Education have recently sponsored an advert for the school which will promote the school across Newport Local Authority. The campaign will be revealed on the 14th October and will be showcased on the back of Newport Buses for six weeks.